My colleague at the Daily Monitor, Mercy Nalungo, borrows my cellphone because all three of hers had run out of purchased minutes. Cellphone use is widespread in Uganda, and many people own several phones to maximize their dollar so that they can call across telecom providers for less money. With increased cellphone usage in Africa has come increased access to social media. One report published last year warned that the rapid growth of the communication tool could lead to more violent conflict. This recent tweet on Twitter from Congolese rebel group M23 shows how militias can be hidden in rural areas but still get their messages out to the masses. Kampala, Uganda – Never mind the Internet, where’s the nearest cell phone tower? That is what’s most important to people in Africa, especially Uganda, where a huge part of the population has not just one cellphone but always two and sometimes more. For a developing country, I have been surprised not only at the widespread use of cellphones but also the extent of coverage. Even in rural villages far away from a city, you can almost always get a cellphone signal. Those of us who live in rural Colorado have much to envy. The extent of cellphone usage and ownership in this country deserves noting for a few reasons. Each phone has its own telephone number, provided by a SIM card you have to buy. So when you ask a Ugandan for his or her cellphone number, you always get two and almost always three. Then you set about calling each number until you reach the person. Which brings me to my cellphone frustration here: Few people set up their voicemail feature on their phone. I have yet to call a person and get their voicemail if he or she does not answer. That means you call people repeatedly, which makes me feel stalker-ish. Unlike in most other countries, when you buy a cellphone, you aren’t required to buy a contract with the provider. In fact, they don’t offer them. Instead, you buy calling cards with a certain amount of minutes. You then load those minutes onto your cellphone. This explains the proliferation of “kiosks” throughout the country, even in the remotest of areas where there isn’t even electricity. Everywhere you turn someone is selling phone cards. Run out of minutes while sitting in a frustrating Kampala traffic jam? Just summon a street hawker who is skillfully running in and out of traffic to your car and buy more minutes. Or, as I have encountered a couple of times, ask someone to borrow her phone and promise to pay her back when you buy a card. Smartphones are not as common as old-school phones. But even those old-school phones let you access Facebook (nice market penetration, Zuckerberg), Yahoo! news and a radio. Many Ugandans get their news by listening to the radio as they travel in a busy city. It has been interesting to me to see how even some of the poorest Ugandans own cellphones. Often, it doesn’t matter if it’s a businessman outside his office or a resident of a slum, odds are, the person has at least one cellphone. 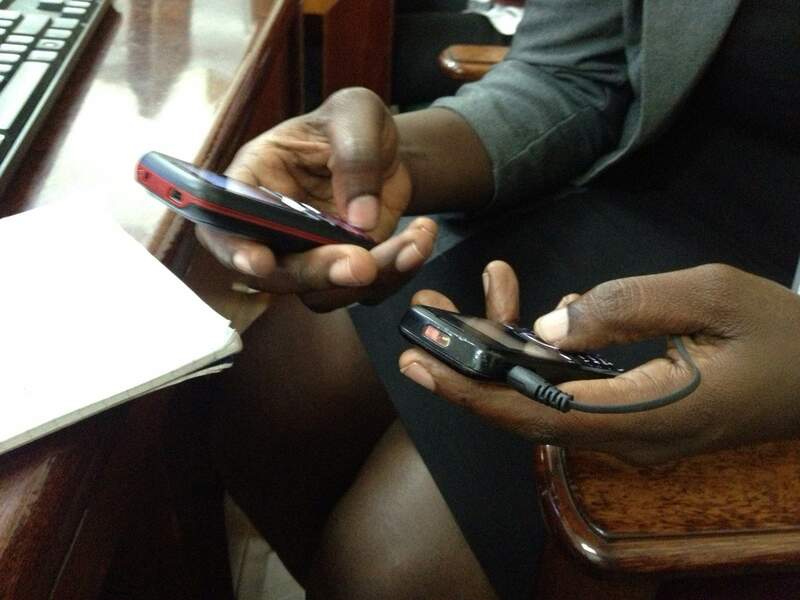 The proliferation of phones is changing the ways Ugandans – and Africans – live. Researchers report that at least 650 million people in Africa use cellphones. That is more than half of the population of Africa. Ten years ago, that number was 54 million. The growth has helped farmers make connections with buyers. For example, microfinance group the Grameen Foundation, leases smartphones to Ugandan farmers so that they can receive information critical to their success, such as weather forecasts, planting advice, market prices, disease threats and more. Farmers who receive the information from cellphones can then share it with their neighbors. Access to social media via cellphone has played a significant role in rebels getting their message out and mobilize their followers. During my time in Uganda, I’ve closely followed the militia group the Congolese Revolutionary Army, more widely known as M23. Active mainly in Congo, the group uses Twitter extensively to inform its followers (but necessarily adherents). Several times in the last couple of weeks the group has tweeted about spontaneous activities and press conferences in coordinated in Kampala. Still, researchers believe that cellphone availability in Uganda and other parts of the continent is one of the most positive developments for the emerging markets, and it may well just be the means of communication that is a key part of the answer to political stability and reduction of poverty.